” Bidding a welcome to the new Foreign Secretary – S Jaishankar ” – January 2015, India. Dr S Jaishankar in his new role as Foreign Secretary, India. The highly esteemed, key and coveted position of ‘Foreign Secretary’ has gone to S Jaishankar, who has been the ‘star’ behind the fruition of US President Barack Obama’s visit to India ( during 25, 26, and 27 January 2015 ). He is an eminently qualified and a talented diplomat. So, S Jaishankar is in and Ms Sujatha Singh is out. The swiftness of change, a la Elon Musk’esque hyperloop, will make speculative philosophers’ minds wandering with fancy leads of reflections and conjectures for sometime at least. Voicing opinions cannot be curtailed in a functioning democracy. 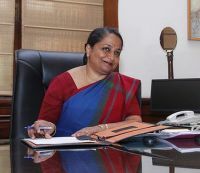 Ms Sujatha Singh ends her diplomatic career. Ms Sujatha Singh has always been good at job; she is neither inept, nor showed any signs of disagreement with the government or the PM. PM, nevertheless, has the prerogative to appoint, dismiss or reappoint secretaries. – inculcating a new sense of integrity of the Government. In business we hold that not every action of the Chief Executive is right and proper just because he is in command, and people at every level also enjoy the liberty to point the mistakes with reason for due acknowledgement. No Chief is infallible. In the same vein, any examination, observation, or judgment of the speedy change by any one will be in order. Public opinion has always been a great force for the good. Hoping that the new year change will bring new direction(s). Tidbit : It is a question whether some nations are interested in our role or our roll in foreign affairs.